Season eight of Game of Thrones is almost here, and OMFG we're still more obsessed than ever. Between Daenerys and Jon's interactions and Arya and Sansa reuniting, we're having a damn heart attack. Basically we're bigger fans than ever before, and we want to show that devotion with cool products. 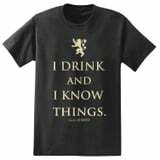 That's why we created a gift guide of shirts, cocktail glasses, books, games, and more that will fuel anyone's Game of Thrones infatuation. Yes, they make great presents, but you can also just treat yourself. You deserve it after enduring season after season of shocking twists. Why Yes, I Would Love to Turn My Toilet Into an Iron Throne - Sorry, Tywin Lannister!